super fun! 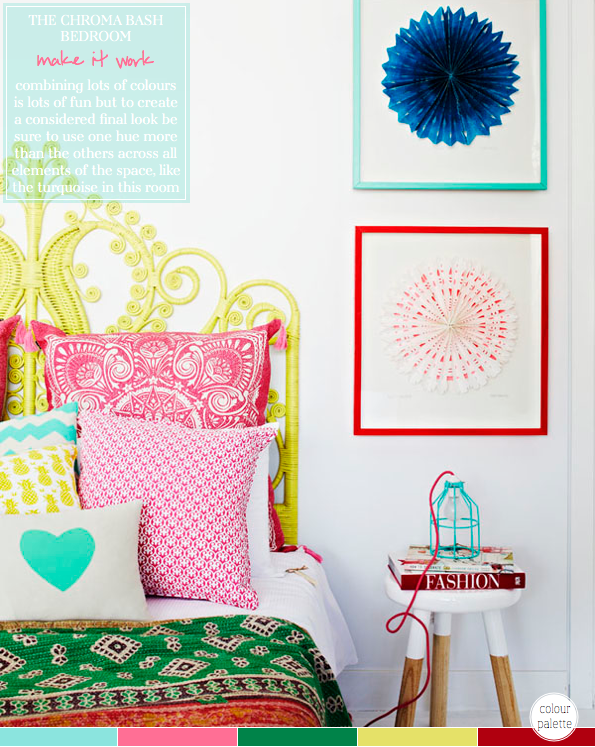 before I went all neutral to my space, I was all about multi-colors and patterns. Didn't know why they work but somehow they turned out beautifully. Now I know the trick: one color more so than the others!! Thanks Mr. for the tip! Very true Will. The turquoise features do bring it all together and make your eye travel around the room from point to point. And yes, the cage lamp is gorgeous! I agree, the cage lamp just makes me smile - I also like its bright red textile cord! Morning, I agree, the turquoise featuring in more than one element does bring the design together, I wouldn't be able to rest in a totally chaotic room, whereas this is thought out and fun. Certainly a cheery room. The cage lamp is funky and that headboard is art work in itself - I think sometimes we don't need too many accessories if we have an elaborate headboard in the centre of a room. The lamp is fantastic! It's a nice & happy room. The lamp...perfect. Love the bold use of colors! what great advice! i love color but haven't found a way to use it where it gives me the vibe i am going for so now i am focusing on a black and white palette, but i do love it and will remember this when i inevitably try for color again! that pendant light is devine! I love this room! It's totally my style. Sometimes I think about changing to more neutral hues but I always come back to the color. I do love this dedroom!So many colors! !Bright the winder! Love everything single thing about this room! This is such great advice Will. And displayed really well with your choice of image. Hi Will, I adore the headboard and the little lamp is fab.